A woman was arrested Thursday night for allegedly driving drunk with her 15-year-old son in her car. Tricia D. Handley,46, was preliminary charged with operating a vehicle while intoxicated endangering a person less than 18 years old. Police stopped Handley in the 400 block of Jefferson after witnessing a white SUV pulling out in front another car. Officers told Handley they smelled an alcoholic beverage on her breath. She then told officers she had about four pints of beers. An open bottle of Kentucky Tavern whiskey was found in the back seat “directly in front of (the son) as well as numerous different open and closed beer cans and bottles,” court document state. Handley failed three standardized sobriety field tests, according to court documents. After being taken to the jail, Handley tested as having a blood alcohol concentration of .138 percent. Officers noted in the probable cause affidavit that Handley was charged for operating a vehicle while intoxicated endangering a person less than 18 and then convicted in 2016. The charge, which is normally a level 6 felony, was reduced to a class A misdemeanor. 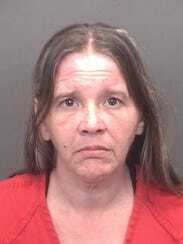 She was sentenced to one year in alcohol abuse probation services.